The Branch 1,000 yard Championship comprises a 30 shot course of fire with muzzle loading target rifles. Competitors have two 1.5 hour details, one in the morning and one the afternoon, to complete this and there is no fixed number of shots to be fired per detail. 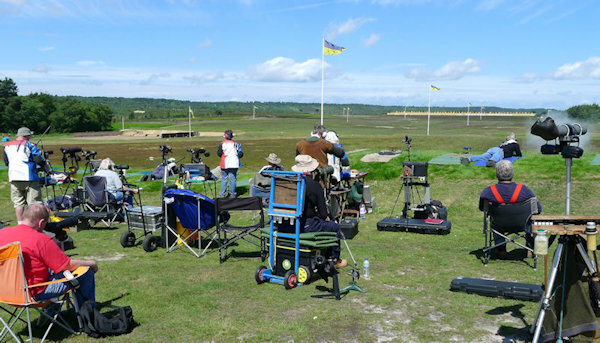 Shooting took place on Bisley's Stickledown Range on Sunday 11 June. The day before many had enjoyed shooting in the MLAGB's National 600 yard Rifle Championships. The sunny and dry weather conditions were pleasant - the strong wind was however somewhat fickle and with already outstretched wind flags picking up on changes in strength was difficult. Franck Rustichelli from France had a good start scoring 58.1 with his first 15 shots, and although that standard eluded him in the afternoon his final score of 91.1 gave him third place. Gary Evans scoring 96 overall was placed second, leaving John Whittaker in the top place with 99.4. It was good to see our members from France and Holland in attendance, giving an air of a mini-international - especially given the French team were using the weekend as trials for their international team! Branch competitions recommence at Bisley on Friday 7 April with the Asquith Cup. This is a challenging aggregate competition for Enfield rifles with 15 shots at each distance, 600 and 800 yards. It offers a fascinating opportunity to gain some insight into how accurate this military rifle can be at long range under the controlled conditions of a target shooting range; ie. known distances, slow fire, prone shooting, and no one firing back at you! The following day is opportunity for some practice at 500 yards in the morning, followed by the Volunteer Trophy at 600 yards in the afternoon. The latter is for military match rifles with their original open rear sights, and is a rare opportunity to shoot these rifles in a competition class of their own. Sunday 8 April is the MLAGB National 300 yard Rifle Championships, and nicely concludes a full weekend of shooting. The MLAGB National 200 yard Rifle Championships is on Friday 12 May, and the 500 yard Championships on Sunday 14 May. On the Saturday between these is the Branch 900 yard Championship in the morning, with practice at 1000 yard in the afternoon. The last of the MLAGB National Rifle Championship matches fired at mid-range is at 600 yards and held on 10 June. All these MLAGB Championships have competition for both Enfield rifle and target rifle. The Branch 1000 yard Championship takes place on 11 June and comprises 30 shots; a long course of fire requiring consistency over the day of shooting.